Sweet spots, those special places in life that delight and bring us personal joy, fill the pages of this surprising and curious travel guide, Life Is Full of Sweet Spots. Written for anyone wanting to take a closer look at some of life’s most fruitful and well known hiding places of lasting happiness, this helpful guide explores the niches and nuances of the earth, the sea and sky, our bodies, minds and souls, and offers its readers new understanding of life and how its beauty and powers make us inwardly hum. Written by the author of Dreams of a Wingless Child, a collection of award winning reflections in verse on nature and life, Life Is Full of Sweet Spots combines the author’s reflections and insights with the experiences and images of over 40 artists and individuals from 20 states, Canada and Australia, plus nuggets of insight, supportive research and notable quotes. It takes the reader from places of gardening, stargazing or touching something wild, to learning and loving, listening to the sounds of silence, or just simply being, as means of feeding emotional wellness and cravings for joy. 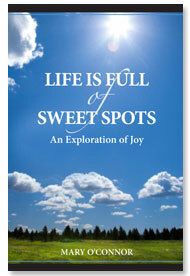 Published by Abbott Press, Bloomington, IN, and offered in soft and hard cover as well as ebook formats, Life Is Full of Sweet Spots ends with a compendium of listings and Internet links to actual places, activities and resources to support ideas sparked by the book itself. The poems found in Dreams of a Wingless Child are presented as an invitation to the reader–an encouragement to find happiness in simplicity, in imagination, in being in touch with whatever lies beyond the obvious. Drawing on the creatures, rhythms and forces of the natural world as her primary source of imagery, award-winning poet Mary O’Connor looks at such subjects as the split heart hoof of a deer, the flight of hummingbirds and butterflies, and the presumed finality of stone and darkness and turns them into metaphors for the emotions and milestones of life. It is through this connection, these fleeting moments of insight, that she finds a sense of place, and with it a realization that one need not look far to find an element of peace, of celebration, of the fulfillment of a dream in this inordinate world of which we are a part.